Stamp mounts are an alternative to using a stamp hinge to affix stamps to your stamp album. They can provide more protection to your stamp, and can give a professional look to your stamps when displayed in a stamp album. A stamp mount is a sleeve that you insert your stamp into. The back of the stamp mount is usually black, and is made up of two flaps. The front is transparent. The sleeve is made of a special plastic to ensure there is little damage to the stamp. The advantage of a stamp mount over a stamp hinge is that it does not attach to gum at the back of the stamp, which is especially important with mint stamps. Although the better stamp hinges are designed to be peelable, there is always a risk that they may damage the stamp or leave a mark on the back of the stamp. It is this reason why some collectors prefer to use a stamp mount to minimize damage to their stamps, especially if they are valuable or mint never hinged stamps. This helps to preserve the condition and value of the stamps stored this way. Stamp mounts come in several sizes to accommodate the different stamp sizes. They can come in long strips that can be cut to size easily with a guillotine or scissors. To affix the stamp to the stamp album with a stamp mount there are two methods that can be used. The first way is the top back flap is lightly moistened to activate the gum and is placed in the stamp album. The stamp mount is then gently lifted at the bottom, and the stamp is placed into the mount. The second way is to lift the flaps of the stamp mount and place the stamp in the mount. The back of the top flap is then lightly moistened, and the mount and stamp are positioned and affixed to the stamp album. The big disadvantage with stamp mounts over stamp hinges is price. 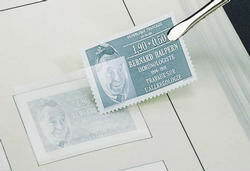 Stamp mounts are more expensive than stamp hinges, but price becomes less important the more valuable the stamp or stamps are to the collector.